Scott Weiland, former frontman of Stone Temple Pilots and Velvet Revolver, has been found dead on his tour bus aged 48. The news was confirmed via an Instagram post, which stated the singer "passed away in his sleep while on a tour stop in Bloomington, Minnesota, with his band The Wildabouts" on 3 December - Weiland was due to go on stage that evening. Weiland was best known for his work with Stone Temple Pilots in the 90s, before fronting rock supergroup Velvet Revolver with former Guns N' Roses members Slash, Duff McKagan and Matt Sorum. Stone Temple Pilots regrouped with the frontman for 2010's self-titled album, before parting ways once more in 2013, after which Weiland returned to recording and touring with his solo band, The Wildabouts and contributing vocals to Art Of Anarchy. 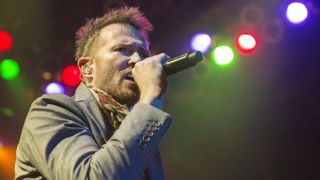 A whole host of musicians, including former Velvet Revolver bandmates Slash and Dave Kushner, have posted tributes to Weiland across social media - a selection is posted below. "Sad day. RIP Scott Weiland"
"Very sorry to hear about Scott Weiland. He was a captivating frontman who had a gift for writing great melodies. RIP"
"We are deeply saddened by the passing of Scott Weiland. Our thoughts and prayers are with his family and fans at this tragic time." "Really sorry to hear about Scott Weiland." "PEACE to the spirit of Scott Weiland." "Sad to hear about Scott Weiland passing. He was a once of a kind epic force onstage. thoughts are w his family #RIPScottWeiland"
"We opened for @STPBand in 2000. I watched them side stage & Scott Weiland destroyed me, he was the real thing. Seeing him changed me 4 ever"
"Very sad news, rest in peace #ScottWeiland #toosoon"
"RIP Scott Weiland Universe, please take care of him." "Extremely saddened to have read Scott Weiland passed. Such a gifted performer. My thoughts are with your loved ones,friends & fans." "Rest in peace Scott Weiland.. You've been an inspiration.. we'll miss you." "Sad to hear about Scott's passing.I hope it wasn't drugs.The saddest part of the story is his kids and family being left behind. RIP"
"Scott Weiland was just found dead on his tour bus :(. Very sad"
"Rock and Roll lost a soul tonight...#rip #scottweiland #yourmusicmovedme"
"RIP SCOTT Weiland. A legend...to the end. Deepest sympathies go to his family and the DeLeo Bros."
"Really sad news about Scott Weiland."